At Zizzz, we use carefully selected and researched materials in all our baby sleeping bags. Every time we design a new bag, we always have baby’s comfort in mind. Good sleep is crucial for your baby's brain development. So creating the right conditions for sleep will benefit your baby and you have the added peace of mind that they are sleeping safely. Toxins are everywhere and they can be harmful to your baby’s mental and physical development, even in tiny amounts. Babies are more vulnerable to the effects of toxic chemicals than adults are. 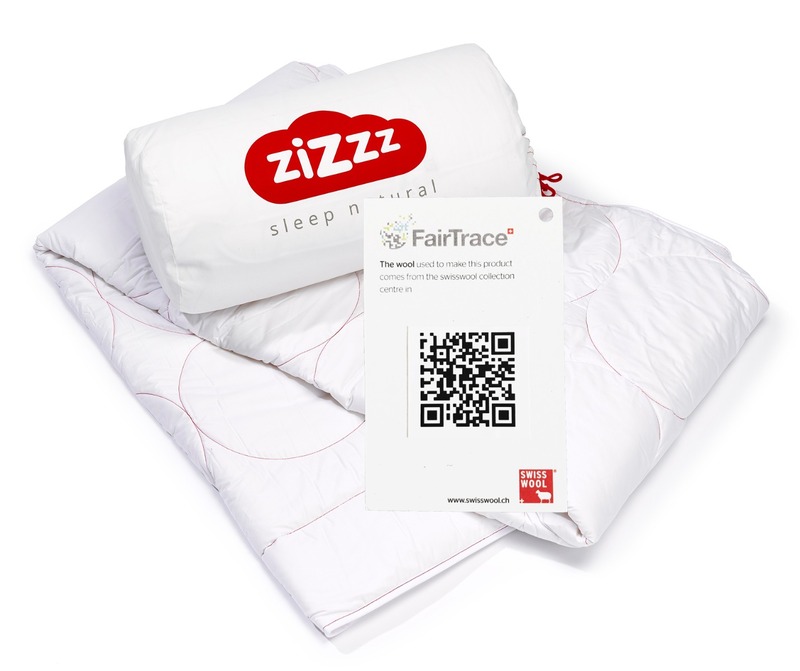 At Zizzz, we select our fabrics to create a pure, safe and healthy sleep environment. Our designers decided to use only soft and silky biological cotton for the inner lining of our baby sleeping bags. It is grown without synthetic fertilizers and pesticides and is kinder to your skin. Farmers have to use large amounts of chemical pesticides and fertilizers to grow normal cotton. These chemicals cause environmental harm. Traces of these chemicals can stay in the fibres and could cause allergies, breathing difficulties and other health problems. Did you know that wool is a natural fire-extinguisher? So even though our baby sleeping bags meet all international safety standards, we don’t need to use fire retardant to treat Swisswool. Many synthetic fabrics have to be treated with toxic fire retardants in order to comply with baby safety standards. Their use has been linked to cancer and reduced fertility. Our baby sleeping bags are for everyday use and the materials we use are easy to clean and maintain. You can machine wash our sleeping bags at 30 degrees. We take care of the details, too. Did you know that wool naturally resists the build-up of odours? It doesn't become smelly like synthetics. Wool stays fresh even without washing. A breathable baby sleeping bag allows air and moisture to pass through. These are the qualities that help keep your baby’s body at the right temperature so they don’t wake up at night. The result is better, deeper and more relaxed sleep – for baby – and for you. Thanks to their clever structure, wool fibres can absorb up to 35% of their own weight in moisture. The moisture goes into the core of the fibre, leaving the outside completely dry. Isn’t nature wonderful! Unlike wool, polyester only absorbs up to 3% of its own weight. The moisture stays trapped between the fibres and your skin, leaving you feeling clammy. Mother Nature has also provided wool fibres with millions of tiny little air pockets. The air pockets provide insulation. They keep the body warm when it’s cold and cool when it’s hot. What is this? This QR code is actually its own product, which was created by a Swiss company called FairTrace. This patented software solution allows you to see the origin of our Swiswool, which is the primary material used in our baby sleeping bags and duvets, and trace it back to its source. Almost all baby sleeping bags have a polyester filling. Polyester is a plastic fibre made from oil, not capable of absorbing moisture. When moisture stays close to the body it results in a clammy feeling. Swisswool is wool reinforced with vegetable fibers to make it washable. Wool breathes and wicks moisture away. This helps you to regulate your body temperature and this is crucial for comfortable sleep. The result is better, deeper and more relaxed sleep. Swisswool is an ecological material made with virgin sheep wool (88%) grown in the Swiss mountains and reinforced with vegetable fibers. Swisswool is a local and sustainable product. Farmers bring the raw wool to collecting places around Switzerland. The fleeces are sorted in different qualities. The finest qualities are then used to produce the Swisswool for Zizzz products. The wool helps to wick moisture away. This together with the breathability makes Swisswool ideal for use as a filling material in sleeping bags and duvets. It helps to keep your body at the right temperature when you sleep. Try it and you will be convinced!